Sig Zane has lived his entire life in Hawaii, raised in Kaneohe and graduated from Roosevelt High. Surfer, fisherman, designer, retailer, Hawaiian cultural artist and practitioner, Zane moved to Hilo for college and never really returned to Honolulu. Nalani Kanakaole, raised in a traditional Hawaiian manner, is a fifth generation hula teacher. Art history major, teacher, and cultural leader, Nalani has lived her entire life in Hilo, raised on homestead lands in Keaukaha. Sig Zane Designs opened their doors in 1985 in downtown Hilo, when other shops wouldn’t carry their work. The first twenty years was spent quietly in Hilo, building a library of art focused on native plants important to hula and to the culture. Hand cutting his designs and hand-screening the fabric, Zane uses the aloha shirt as a canvas to express stories of our islands and its culture. His works spans more than three decades, first beginning with the simple two-yard pareu, a sarong made as gifts for friends. Besides aloha shirts, his art has been used on airplane livery, in hotel rooms and on the sides of buildings. The company also designs logos. Hawaiian Electric is one of his most visible brand identities. 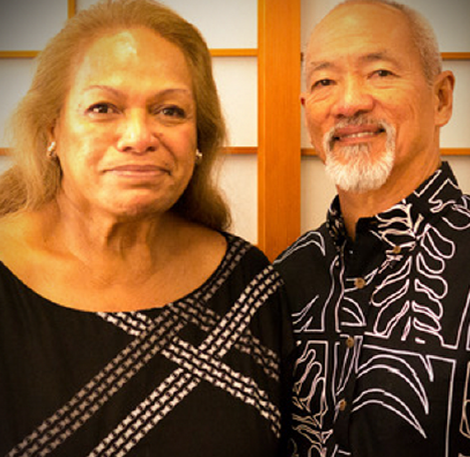 The company and their work has always involved the ohana. As a team, they continue to share their insights to art and culture in their work with corporations, the visitor industry, and especially for the next generation of islanders. His son Kuhao has been working for the company for the past fifteen years and runs the design department, leading its growth both in Hilo and Honolulu. Through story, they believe they can help perpetuate the teachings of their forefathers, ensuring that the next several generations will have a strong connection to our island’s roots and traditions. We hope you will join us as we honor the contributions of this family to our island business community. Mahalo.